For many years, the International Business Machines Corporation’s earnings glided smoothly upward. Every quarter, IBM would report higher earnings per share. Even Warren Buffett invested in the company, disregarding his long-held aversion to technology companies as too challenging to forecast. Virginia M. Rometty, IBM’s chief executive — and recently anointed the most powerful woman in business by Fortune magazine — has talked a good game about focusing on “shareholder value.” For the first several years of her tenure, she managed to prop up the stock by buying back shares by the cartload. In the first six months of this year, the company spent more than $12 billion — that’s billion with a “b” — on its own shares. She’s also been sending shareholders thank-you presents in the form of large dividends. But all these “shareholder friendly” maneuvers have been masking an ugly truth: IBM’s success in recent years has been tied more to financial engineering than actual performance. That became readily apparent Monday morning when the company announced its earnings, missing analysts’ expectations by a wide margin. The stock fell more than 7 percent to $169.10 by the end of the day, below the average price Mr. Buffett paid since he started buying the stock in 2011. The company’s revenue hasn’t grown in years. Indeed, IBM’s revenue is about the same as it was in 2008. But all along, IBM has been buying up its own shares as if they were a hot item. Since 2000, IBM spent some $108 billion on its own shares, according to its most recent annual report. It also paid out $30 billion in dividends. To help finance this share-buying spree, IBM loaded up on debt. All of which is to say that IBM has arguably been spending its money on the wrong things: shareholders, rather than building its own business. “IBM’s financials make it self-evident that its stock-rigging strategy is not about value creation through ‘investment,’ ” David A. Stockman, the director of the Office of Management and Budget under President Ronald Reagan and a banker on Wall Street, wrote on his website earlier this year. “IBM is a buyback machine on steroids that has been a huge stock-market winner by virtue of massaging, medicating and manipulating” its earnings per share. The buybacks and dividend payments have managed to keep activists and vocal hedge-fund investors at bay — at least so far. 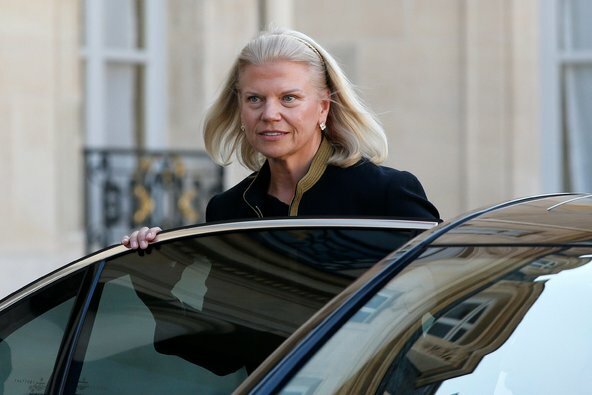 But if IBM’s performance doesn’t turn around, and soon, Ms. Rometty may face a mini-mutiny. Ms. Rometty is a well-regarded manager who is facing an uphill battle that is not of her own making. Most of the old-line enterprise technology companies, including Hewlett-Packard, are in a challenging environment as their clients become less dependent on traditional services and move into “the cloud.” And the cloud’s profit margins are far slimmer. Ms. Rometty has signaled that she is trying to reposition IBM for the future, and she has taken substantial steps toward that goal. But like some of her competitors, she appears to be late. And, unfortunately, shareholders weren’t vocal enough early on because they were too focused on the rising stock price and the dividend payments that made the company appear so healthy. Let’s be clear: IBM is not going out of business. Far from it. It has substantial cash and access to the debt markets. Its turnaround strategy is underway. The big question is whether the turnaround will be successful. Of course, there’s also the question of what IBM should have done with all that cash burning a hole in its pocket. Well, what about a major game-changing acquisition? Ms. Rometty has made a number of deals, but most have been incremental. Investors and analysts suggested big, transformative transactions like buying Salesforce.com, putting IBM squarely in the cloud. Or Workday, another enterprise highflier. Or a major online security company. The history of stock buybacks is decidedly mixed. Some of them turn out to be great winners, others losers. It’s all about timing. There’s also a dirty secret about why some executives love stock buybacks: In certain instances, they can have an impact on executive compensation by goosing certain metrics that boards use to measure a company’s performance. Of course, as in any story, there’s another side. In this case, it is Mr. Buffett who has espoused the other side of the argument in favor of stock buybacks. So yes, Mr. Buffett is right that stock buybacks can be effective at creating value, especially if the company buying back its shares can do so on the cheap. But Mr. Buffett’s theory becomes more complicated, to put it politely, when the company, like IBM, appears to be in decline. The question for Ms. Rometty is whether she can figure out how to turn around IBM — not just its numbers, but also the company itself. Posted on October 22, 2014, in Postings. Bookmark the permalink. Leave a comment.